The U.S. and Japan began the biennial Keen Sword exercise at military installations throughout Japan and surrounding waters. The U.S. military and the Japan Self-Defense Force (JSDF) began a biennial 10-day military exercise, dubbed Keen Sword, at military installations throughout Japan and surrounding waters on October 29. 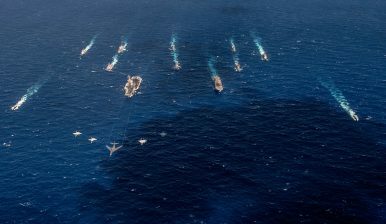 The exercise, designed to increase the combat readiness and interoperability of U.S. and Japanese forces, involves dozens of U.S. and Japanese ships, hundreds of aircraft, and around 57,000 personnel from both nations. Approximately 10,000 U.S. military personnel from the U.S. Pacific Fleet, U.S. Forces Japan, 7th Fleet, 5th Air Force, 374th Airlift Wing, 18th Wing, 35th Fighter Wing, and III Marine Expeditionary Force will take part in the exercise, according to a U.S. Pacific Fleet press release. The last Keen Sword military drill was held in November 2016, which for the first time since the inception of the exercise in 1986 involved joint amphibious assault operations. This year’s Keen Sword will also feature amphibious assault operations, including practicing the recapture of an island around and on the U.S.-owned islands of Guam and Tinian in the northwestern Pacific Ocean. Like in the exercise’s previous iteration, the JSDF dispatched its recently stood up Amphibious Rapid Deployment Brigade (ARDB) for that portion of the drill. Elements of the ARDB were also involved in Kaagapay Ng Mga Mandirigma Ng Dagat (KAMANDAG) 2, a bilateral U.S.-Philippine military training exercise, in the Philippine Sea earlier this month. In January, the ARDB participated in a bilateral amphibious training exercise, codenamed Iron Fist, hosted by the United States Marine Corps (USMC). The JSDF remains prone to interservice rivalry and still suffers from a lack of interservice cooperation, which has also affected the ARDB. The new unit also lacks a sufficient number of operational Assault Amphibious Vehicles (AAV) 7s (only 15 out of 52 are currently operationally deployed) and there have been delays in the induction of V-22 Ospreys. The Keen Sword exercise will also involve search and rescue, anti-submarine warfare, as well as joint ballistic missile defense operations, among other drills. Two Royal Canadian Navy ships will participate in the maritime portion of the Keen Sword exercise for the first time, along with observers from several other partner nations. The Japan Air Self-Defense Force confirmed that a missing F-35A has crashed.